Sen. Feinstein: Sotomayor described remark as "a poor choice of words"
WASHINGTON (CNN) -- Judge Sonia Sotomayor has spoken for years about how her experiences as a Latina woman have influenced her public and private life. Judge Sonia Sotomayor has been meeting with lawmakers in advance of her confirmation hearings. In her speeches, she often discussed her "Latina soul" and explained how even the traditional dishes of her Puerto Rican family shaped her views. And she often said that she hoped those experiences would help her reach better judicial conclusions than someone without such a varied background might reach. "I would hope that a wise Latina woman with the richness of her experiences would, more often than not, reach a better conclusion." That sentence, or a similar one, has appeared in speeches Sotomayor delivered in 1994, 1999, 2002, 2004 and 2001. In that speech, she included the phrase "than a white male who hasn't lived that life" at the end, which sparked cries of racism from some Republicans. Those instances were included in documents Sotomayor sent Thursday to Capitol Hill, part of her response to the lengthy questionnaire sent to her by the Senate Judiciary Committee before her Supreme Court confirmation hearing. Sotomayor supporters brought up the 1994 speech themselves, after former House Speaker Newt Gingrich, radio host Rush Limbaugh and others labeled Sotomayor a racist over the remark. Gingrich has since recanted. The supporters point out that Republicans did not object to those remarks in 1998 during Sotomayor's confirmation to the U.S. Court of Appeals for the 2nd Circuit. "She told me she had used the phrase before but that she would not be using it again," said Sen. Susan Collins, R-Maine. "She's clearly a very bright individual who learns from her past mistakes," Collins said. 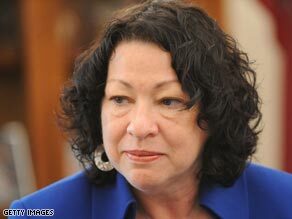 But Collins said she was "still uncomfortable that she [Sotomayor] made the statement, particularly as a sitting judge." "I can understand her explanation that it was intended to be a statement to inspire the young people to whom she was talking and that it did not reflect how she approaches cases before her," she said. "But that's why I want to read more of her cases to make sure that is the case." Sen. Dianne Feinstein, D-California, said after meeting with Sotomayor that the judge had told her, " 'It was a poor choice of words. If you read on and read the rest of my speech you wouldn't be concerned with it, but it was a poor choice of words.' "
But Senate Minority Leader Mitch McConnell of Kentucky wasn't mollified. "If it was a bad choice of words, it was a bad choice of words repeatedly ... leading one to believe that it probably wasn't just an isolated statement but a core belief," he said. Sotomayor's point -- that a person's experiences influence how he or she sees the world -- doesn't sit well with some Republicans, who believe that viewpoint means the law takes a back seat to a more nuanced judgment. It also highlights a basic difference in how many conservatives and liberals view the federal judiciary. Many conservatives seek a strict adherence to the law as it is written, while many liberals believe that the circumstances of individual cases could lead to differing decisions even if two cases appear nearly identical on the surface. CNN's Dana Bash and Emily Sherman contributed to this report.